It was a greyish rainy day when Mukhtar and the Avar community of a small Georgian village near the Russian border of Dagestan received us, a group of young students coming from France, possibly representing the only thing that stirred the village for a while. Mukhtar’s hands were the hands of a countryman, big, coarse and trenched, but his enthusiasm of having the chance to teach to complete, but nevertheless interested strangers, the history and sufferings of his people was absolutely catching. In that village we had the eye-opening experience of how little it takes to make people feel happy and welcomed. 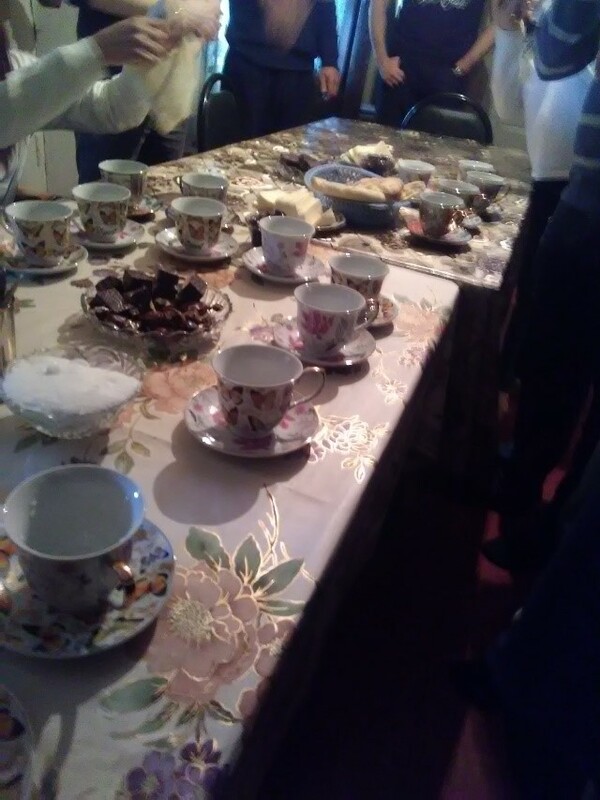 Freshly baked bread, white cheese, homemade gooseberries jam and brewed tea were our main meal for the day, all thanks to the hospitality of Mukhtar’s household. In the high mountains of the border with Dagestan, where snow had not melted even in the beginning of April, it seemed that the EU was merely an idea, just another name, probably a name that the villagers never even heard. What would the Avars gain should Georgia become a member of the European Union? Alternatively, in Tbilisi, it was a totally different perspective. The dissemblance between the capital and villages is like night and day, inequality is drastic even within Tbilisi, and it is something that we could spot without much effort: modern, latest edition Mercedes vehicles waiting for the same traffic light to turn green side by side archaic Soviet-style cars; rugged, sunburnt, badly dressed street beggars walking on the same avenue that was selling Chanel lipsticks and Yves Rocher perfumes. Even the French ambassador told us during the trip, while addressing rural-urban discrepancies: “Georgia is 20% Kosovo and 80% Uganda”. And yet this society feels European. During the field trip we had the impression that Georgians expect so much more that the EU has to offer, but also, they are ready to work selflessly and with dignity towards what they are expecting. The EU is certainly no miracle-maker, but it nevertheless knows what failure feels like in promoting important values such as democracy and rule of law in the neighbourhood countries. Georgia might be an exception, but how efficient is the EU’s commitment to the country’s promotion of democracy, stability and security? What is the main force that distinguishes Georgia from the rest of the Caucasus? As we travelled our way through different locations and met with people from different backgrounds, there was one clear and common point they all made: Georgia is part of the European civilisation. This country was indeed portrayed as an island of Europeanness inside the Caucasus mosaic. This feeling of being part of the European nations is both a way to claim legitimacy towards their European integration, while at the same time standing out their specificity inside the regional ensemble of the South Caucasus. It is as if being Georgian meant being pro-European, compared to their neighbouring country either Muslim countries or pro-Russian ones. This comparison to other countries inside the Caucasus regional ensemble is thus a way to both have a foot in and out Caucasus, where a territory exists only in the way it differs from the other ones. All in all, Georgian-specific Christianity and their Europeanness were both identity-defining factors through differentiation, as it occurred to us. This narrative is visible on many levels: on the national narrative level, on the political level, and on the personal level. As far as the national narrative is concerned, our visit of the museum of the soviet occupation, inserted the Museum of National history, gave us great clues about the feeling coupled with the necessity of being European. Being European is indeed a way to both deal with the trauma of soviet and Russian “invasion” and “occupations”, as Russia, contrary to Georgia, is defined as non-European. That is why the museography insists on how this European feeling extended way back in history, from Christianity, up to the temporary Democratic Republic of Georgia (May 1918 – February 1921). In this museum stood a big panel allegedly quoting Noe Zhordania, head of the government of the democratic Republic of Georgia, who made a speech at the extraordinary session of the constituent assembly on January 27th 1921. It said “Soviet Russia offered us military alliance, which we rejected. We have taken different path, they are heading to the east, and we, for the west”. 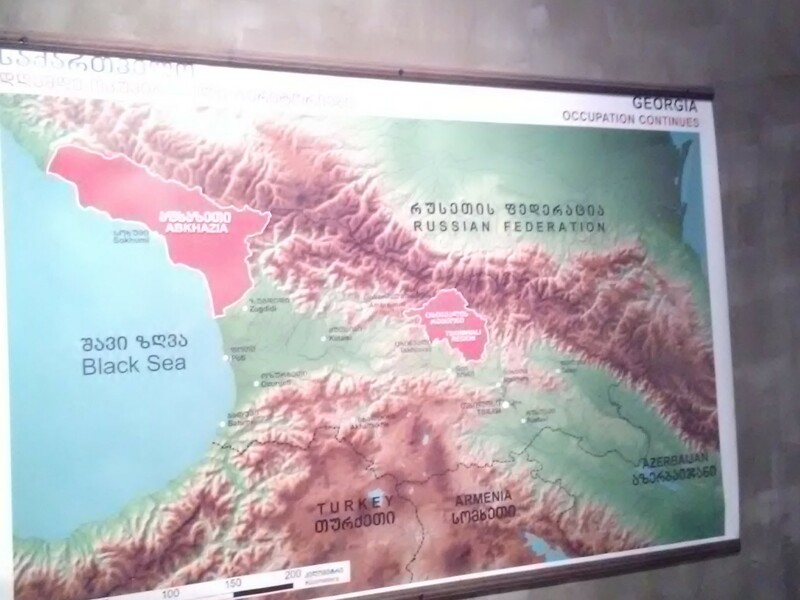 In the last part of the room stood a map entitled “Georgia, occupation continues”, highlighting South Ossetia and Abkhazia as occupied by Russia. This official narrative thus pictures Georgia as an island of long lasting Europeanness, whose predestination of being art of the European club was only hindered by imperialist forces. On the political level, Georgia has been a part of the European Neighbourhood Policy (ENP) since 2004 and Georgian authorities have considered this policy as an opportunity for developing further ties with the EU, amounting even into accession perspectives. But most importantly, the Eastern Partnership of the 20th of May 2009 responded to the critics made to the ENP, and received a positive echo in Georgia. One of the criticisms of the ENP was the “one-size-fits-all” approach of the policy, which did not take into account the specificity of the beneficiary states of the policy, putting countries with very different backgrounds on the same level. That is why the Georgian decisions-makers and academics were sharp critics of the ENP. Being proud of their long European history, most Georgians found it absurd that the EU developed the same policy for them and non-European states such as Egypt.” One of the main points of criticism made by Georgians was as such the lack of consideration of their European specificity. And even though Georgian officials are realistic about an out-of-sight integration perspective, the opportunities offered by the ENP and the EaP gave the chance for Georgia to stand out as west-oriented and pro-European. There is no need to have a close look to see the importance of the EU in Tbilisi, as the cityscape and its toponymy are seeded with European flags and references. The EaP had some economic benefits, as it paved the way to a Deep and Comprehensive Free Trade Agreement signed in 2014. The DCFTA developed such close ties, that the EU allowed what was most demanded by the Georgian population: the access to the Schengen zone in March 2017. As a result, from the 28th of March 2017, Georgian citizens holding biometric passports can travel to the Schengen Zone without a visa for a period of 90 days within any 180-day period for purposes other than working. The then Georgian President, Giorgi Margvelashvili, said such liberalisation was an “enormous achievement.” Among all measures vis-à-vis the EU, the visa-free entrance inside Schenghen was by far the most popular one, according to the members of the Georgian foreign office we had the chance to interview during our field-trip in Georgia in March 2018. Besides the obvious economic opportunities this visa regime gave to Georgians, let us there draw an hypothesis there. This visa liberalization is popular and important on the identity level, as it allowed Georgian citizens to escape their insularity inside the Caucasus, and finally reach the continent they felt they were predestined to belong. So with this visa regime, all levels converged: Georgia found its access towards Europe again, and Georgians were able to reach the economic opportunities inside the continent some feel to have always belonged to. What most prominent ENP success stories have in common are pro-democratic and reformist attitudes of domestic political actors and civil society. The influence of these actors and attitudes in the interaction between the EU and its neighbourhood appears to be a crucial one, as well as one of the main factors to explain why some countries have democratised more maturely and more profoundly than others, also part of the ENP and belonging even to the same region. Since the EU offers virtually no membership perspective for the ENP countries, we might be tempted to believe that this makes the EU an ineffective actor in promoting democracy in the region. However, this politics of carrots and sticks does not explain per se why certain ENP countries, with Georgia among them, have democratised more efficiently than others. EU cannot speak with a single voice, especially where there are clashes between democracy and stability. Thus, in certain situations the EU will not apply its democratic conditionality, favouring stability over other core principles that it was supposed to protect. That is why the effectiveness of EU’s democratic conditionality depends on domestic conditions and that is why Georgia is a successful case. While Georgian authorities might have very well understood by now that membership perspectives are remote and not possible, they remain quite positive that an accession might take place in the future, placing as such this policy objective in the top of their foreign politics, as high officials of the Ministry of Foreign Affairs explained to us in Tbilisi. However hypothetical a future accession might be, the EU’s position in enforcing principles of democracy in Georgia works in favour of the country’s progress. This would not have been possible though, if it was not for domestic pro-democratic reforms and commitments. In the end of the day, the roads of Mukhtar’s village will still be muddy, his hands will still be the ones of a peasant, but Georgia will be progressing. What Georgians need to keep in mind though, is to firstly be proud of themselves, rather than proud of EU’s attention and care towards the country.